Taxi Keistad is a young, dynamic and fast-growing company. It disposes of a fleet consisting of ten taxis and a bus. 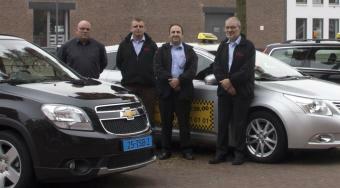 Taxi Keistad has eight enthusiastic chauffeurs who all own part of the company. Because of this construction, our drivers have an active and involved work attitude. As a customer you can, for example, find this in the service and the maintenance of the material the drivers work with. A driver from Taxi Keistad is a driver who has years of working experience in the business. You will notice that our drivers are more than simply persons who take you from A to B. Naturally, the drivers all dispose of an extensive street knowledge, are very skilled with regard to communication and you will see that service is still considered self-evident in our company. Many people call for a taxi only when it is absolutely necessary. The primal cause of this can be found in the high rates that are currently charged for a taxi ride. With regard to this, Taxi Keistad is very different. Our rates are one of the lowest in mid-Netherlands. You shall see that these differences are also clear on shorter taxi rides. Click on prices in the menu and find out that a taxi does not have to be expensive!